Yesterday, I was inside working, and my father-in-law had just pulled in with a tractor and mower. He was outside working, and all of a sudden, I heard this loud noise and it continued for about half a minute or so. I thought that my father-in-law had run over something with the mower or that something else had happened. So, I went running outside to see what had happened. But, nothing had happened. It was a beautiful day. The sky was bright blue and sunny. 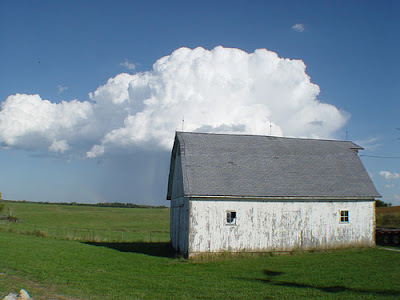 Yet, there was this one giant bright white cloud over my barn, and it was thundering. Just that cloud was thundering. It was really weird, because there were no signs of rain or storm anywhere! So, I went back inside to work. In a few minutes I heard "Misty?" being yelled from outside, so I jumped up and went running. My father-in-law was standing there and he asked "Did you see the rainbow?" He pointed to a rainbow that was coming out of the weird cloud. I went running for my camera. Unfortunately, the rainbow had faded by the time I got the camera, and that really disappointed me. When my husband got home last evening, he asked "Did you hear that thunder this afternoon?" I told him the story about it, and he told me that it was so loud where they were working that they thought something had exploded. It was very strange, I tell ya! Unfortunately, you can't really see the rainbow (It's to the left of the barn) because it had faded.